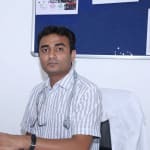 Dr. Mangesh Pawale is a trusted General Physician in Beed By-Pass Road, Aurangabad. He has been a practicing General Physician for 14 years. He is a MBBS Bachelor of Medicine and Bachelor of Surgery, - CPS Mumbai, AFIH, Advanced Cardiac Life Support ( ACLS ) . He is currently associated with Arogyam in Beed By-Pass Road, Aurangabad. Don’t wait in a queue, book an instant appointment online with Dr. Mangesh Pawale on Lybrate.com. Find numerous General Physicians in India from the comfort of your home on Lybrate.com. You will find General Physicians with more than 35 years of experience on Lybrate.com. We will help you find the best General Physicians online in Aurangabad. View the profile of medical specialists and their reviews from other patients to make an informed decision. Check you bmi, maintain a healthy weight. If you are overweight, ask your doctor to create a weight loss plan for you.